Points : 98 out of 100. In 2002, after her graduation from the conservatory of Alkmaar, department Guitar Jazz & Pop, Eveline van Kampen wanted a band to give the music in her head a concrete voice. She asked Peter H. Boer, who also participated in her graduation project, and who also is the bass player of the progressive-fusion band Songs of the Exile. The next step was to find a singer and drummer. Singer Esther Ladiges was happy to join in. She graduated in jazz vocals at the same conservatory, and is known for her contributions to Sangamo, Ixion, Entropy and Ayreon. Emile Boellaard was an obvious choice for the drums, since he is also a member of Songs Of The Exile. As the fifth member, John the Bruin joined on keyboards and guitar. Illumion started out with some of Eveline's original compositions and covers from bands like Pain of Salvation and Fates Warning, finding a way to combine the various musical influences to a unique style and to create new music out of that inspiration. After a while, John de Bruin announced that he wanted to concentrate more on guitar and less on keyboards and because of the need for a keyboard player, he left. He was replaced by Annemieke de Boer who got in contact with Eveline a few weeks ago after listening to some really interesting songs on Illumion's my space site a while ago. 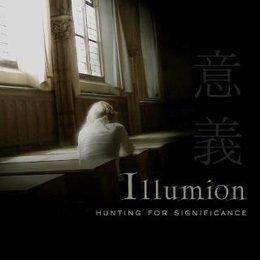 Illumion's music is a bit hard to describe, but their main style is built around progressive, symphonic rock music with definite feminine edges. Musically this album has been a challenge to get into with the different styles and songs, but when it comes to progressive rock albums so far this year I feel this stands forward as a highlight. The lyrics on the album is built on historical and literary themes. 'Encomium' opens the disc, and a chainsaw lead the way to a a really fine progressive rock song with a nice melody and strong vocals from Esther Ladiges. The song is built on a way that you need to listen and have good time to hear all the fine instrumental details, and the more I hear the song the better it gets! 'Scarlet Sin' opens moody with emotional fine singing and great instrumental details. The song changes and gets a more dark feel with more guitars. The melody and vocals is delicate and give the song a great mood. You will also very fast notice the guitar playing from Eveline, that holds a very high quality that you will love! The start of the next song 'Chrysanthemum' is a proof of fine guitar playing! A more symphonic melodic song with a fine melody, and you easily remember the melody lines after some listening's. The instrumental part after two minutes and forty seconds is really entertaining and interesting to listen to with great details! 'Into The Labyrinth' opens soft and dreamy, a cool song that slowly builds with more power, but it has a fine mood all the way that is very relaxing and give me a good feel. 'Metamorphosis' continues a bit in the same direction, but is a more challenging song that grow for each listening. The vocals and instrumental performing is just fabulous with cool details on the keys, guitars and drums. 'The Prophecy' is one of my favorite songs, a more straight forward delicate progressive rock/ metal oriented song with a strong melody, cool riffing guitars and nice floating keys. You will also notice the key solos and the jazz influenced guitar solo in this song. 'Under The Harrow' opens with some strong riffs on the guitars, a song that changes much with different styles from the emotional beautiful to a more dark progressive style. The drums has many cool details in this and also the bass and keys give the song an own feel. 'Died For Beauty' is a more advanced progressive styled song that took me some listening's to get into, but also here there is a lot of details and different parts that grow for each listening! 'Infinity' opens a bit mystic with some fine sounds and Esther`s nice vocals. A progressive moody rock ballad with a strong melody, the song builds up with a bit more power round the chorus parts. The bass playing play a big part in this, and the guitar solo is delicate! 'Whirlwind' has a cool rhythm, and sounds partly like a progressive reggae oriented song, a special song with an own twist that bring something new an interesting into the world of music! 'The Bliss' ends this fine musical journey from Illumion, and for fans of progressive rock and for people who are searching for something that sounds out of the ordinary with its own twist and style you have to check out Illumion now!! !